As part of Haritha Haram, the flagship programme of Telangana Government, a tree plantation drive was conducted at Army College of Dental Sciences (ACDS) in Secunderabad today. Commissioner of Police Shri Mahesh Muralidhar Bhagwat, IPS was the Chief Guest on the occasion. Deputy Commissioner of Police, Malkajgiri Shri Ch R Uma Maheshwara Sarma and Assistant Commissioner of Police, Malkajgiri Shri Syed Rafeeq were the guest of honors for the event. Around 500 saplings were planted in ACDS campus by the Chief Guest, guest of honors, faculty, students of ACDS, and also by the students of Zilla Parishad High School (ZPHS), Jawahar Nagar. Speaking on the occasion, the Chief Guest said that increasing the green cover is a collective responsibility. Saplings were also planted by the Principal of ACDS, Dr. K.V. Ramana Reddy and the Registrar Colonel (Retd) K.G. Menon. DCP Shri Ch R Uma Maheshwara Sarma administered an oath to all who were present at the programme to protect the saplings. 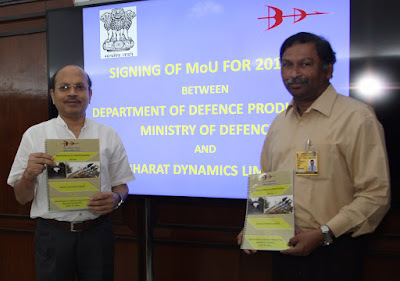 Bharat Dynamics Limited (BDL), a ‘Mini-Ratna’ Defence PSU has signed a Memorandum of Understanding (MoU) with the Ministry of Defence for the Financial Year 2017-18. The MoU, which was signed by Shri V Udaya Bhaskar, CMD, BDL and Shri Ashok Kumar Gupta, IAS, Secretary (Defence Production), at New Delhi on 18 Jul 2017 outlines targets and various performance parameters for BDL for the Financial Year 2017-18. The revenue from operations, as per the MoU, has been targeted at Rs 5300 Cr., which is an increase of 20% over the previous year. Continuing with its green energy initiative, BDL has planned 5 MW Solar Plant at its upcoming Unit at Ibrahimpatnam in Telangana. A substantial emphasis has been made on R&D by the company in pursuit of its self-reliance. Design and development of Advanced Data Field Loader is planned for the Financial Year 2017-18.